In 1579, the Scottish Parliament passed an act which made individual parishes responsible for enumerating their own poor. More than merely enumerate, however, the purpose of the law was an "inquisition" into the circumstances of the individual poverty, so as to determine whether the poor were able to work, whether they had any other means of subsistence, and whether there were other persons, family or others, who might assist them. The laws at that time codified the need to assist the poor—but at the same time as outlawing what were apparently considered public nuisances: begging and vagrancy. In 1595, Buttock Mail, a Scottish poor rate began to be levied. There was further legislation in 1597 which made the parishes rather than the church responsible for the administration of poor relief. In 1672, magistrates were ordered to build correction houses or workhouse so that beggars could be made to work. In the same document you can read that Glenbuchat had its own inspector of the Poor, Mr Cree, who could examine requests for relief. 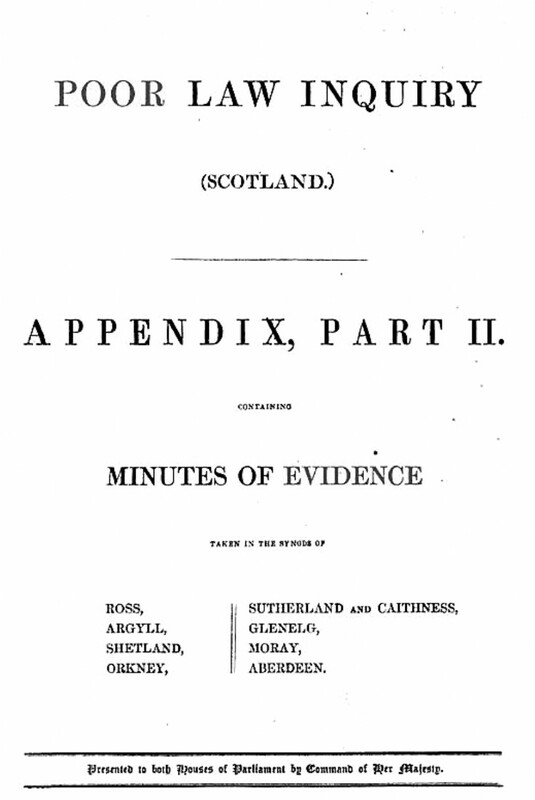 The evidence given below demonstrates the responsibilities of the minister for overseeing the Poor relief and the Laird or owner of the land who in the case of Glenbuchat was Earl Fife who contributed a large part of the funds. I am minister of the parish of Glenbucket and have been so for thirty four years. There is no assessment in my parish for the relief of the poor. The funds are managed exclusively by the kirk session neither the heritor nor his factor ever attends the meeting for the distribution of relief. We have only one heritor in the parish and he is non-resident. He always sends contributions to the church collections when I apply to him but I apply very seldom. The last contribution which I received from him was about six years ago when he sent twelve bolls of meal but without reference to the poor funds. He always gives me money for the poor when I ask him. The usual allowance to paupers on the roll is from 14s to 16s a year. We have at present no bed ridden person on the roll, nor orphans, nor widows with children, nor deaf and dumb nor blind persons. We have one idiot on the roll, an old man above eighty. He lives with a grandniece who is about fifty years of age. He receives 21s a year from us, some meal and likewise some soap. His niece can work and can partly maintain him, but latterly he has required such constant attendance, that she has not been able to work much. He is chiefly maintained by individuals in the parish who are very kind to him, and who drive his fuel for him. The seventeen impotent poor on our roll are chiefly maintained by their neighbours, aided by the sum given by the Kirk session. Many of them can work a little, hoeing turnips at harvest work and drying peats in the peat season. I may add that we always cart home their fuel for them from the moss. I think in this way they are tolerant we 1 provided for. We do not provide any medical relief for the poor from the poor funds. The doctors attend the poor gratuitously. When the poor are sick we do not provide diet from the poor funds and some of the farmers assist them on such occasions with wine and other cordials. We do not pay for midwifery cases from the poor funds. We have regularly educated midwives in the parish who charge 5s for their attendance. We defray the funeral expenses of paupers we allow for this purpose about lL A coffin costs about 14s and the expenses of winding sheet and grave digging absorbs the other is. The children in my parish are generally vaccinated gratuitously by some medical man. There is no begging in the parish. We used to have a host of beggars from Aberdeen and from Perth and other places but the begging has been so pressed in a great measure since the institution of the rural police. The usual food of able bodied labourers is potatoes sowans milk and brose. The diet of the paupers is much the same but perhaps they cannot get so much milk. The people in my parish are temperate in their habits especially since the suppression of illicit distillation. They are very active and industrious and cultivate their farms very well. The general size of our farms is about from four to five acres of arable land but a large extent of pasture land is generally attached to a fam. The rent of the arable land is generally about 14s per acre but rents have lately been lowered. We have several crofts about four acres and six acres and we find that the system of having a gradation in the size of farms works very well. We have no class of persons in our parish who subsist entirely by day labour and have no crofts. The people in my parish are very well educated and are very clever. They can all read and write and know arithmetic and some of them know a little Latin. They are all taught intelligently to understand what they read. There has been an immense improvement in my parish in education as well as in everything else within in remembrance. It was formerly an ill cultivated country but it is now a very well cultivated country and the general habits of the people have improved. I distinctly trace the great improvement of the people to two causes. In the first place the improvement in their education and secondly the kindness and intelligence of Lord Fife in granting them moderately rented leases.